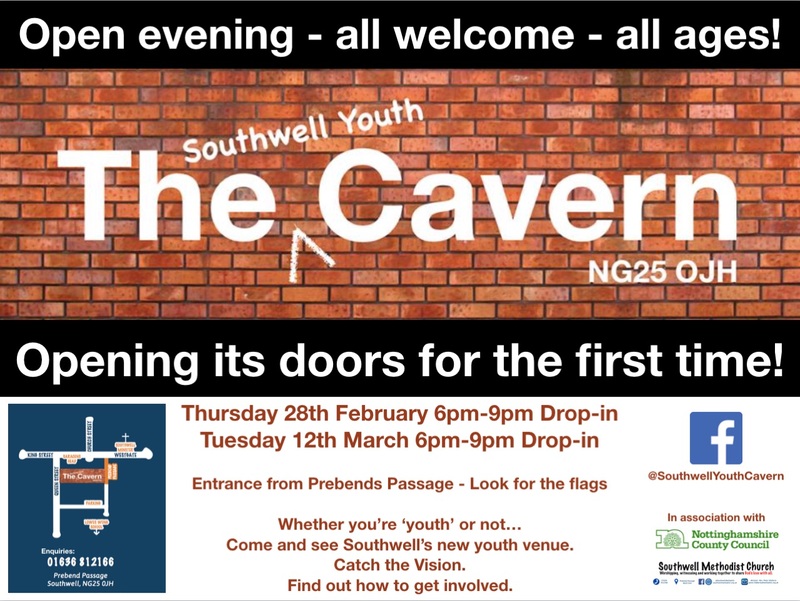 The Southwell Youth Cavern, Southwell's new youth venue is to open its doors for the first time for two open evenings in February and March. A steering group of volunteers from the Council Council, local churches and community groups has been meeting for a number of months to plan and transform the cellar space of the Methodist Church, located behind the Saracen's Head Public House, into a dedicated venue for youth activities in the town. The plan arose from locals feeling that there was nowhere for the youth of the town to go on a regular basis and a desire to provide a safe space for young people to feel at home. The project's manager, Rev Peter Hibberts, Minister of Southwell Methodist Church said: "We want the youth of the town to have somewhere safe that they can go and make their own, to feel welcome, to belong." Councillor Roger Jackson added, "The [Southwell Youth] Cavern Is an exciting project. We would like to invite all people of Southwell and the surrounding villages, young and old, to get together and create a place where young people can express themselves and make new friends." An area incorporating a toilet, kitchen and hall space has been designated for use Tuesday to Saturday and internal building work, funded by the local council and local churches, is to take place in the next few weeks to prepare it for the activities. The long term plan is to have a five-day-a-week venue where smaller projects can locate and provide activities for young people from Southwell and the surrounding area. The space will also host the return of 'The Core', Southwell's Youth Club which used to meet in the Library. The open evenings, which will run between 6pm and 9pm on Thursday 28th February and Tuesday 12th March, are an opportunity to show the community, including its young people, the space and ask for both ideas and help. The project hopes to attract a volunteer management team of locals who will oversee the space and facilitate local youth projects under its roof. 'The Core' is also hoping to attract new volunteers from the community to run the Youth Club itself. Members of the general public, of all ages, are invited to drop in on the open evenings to view the space, catch the vision, and find out how they could be involved.